ØLEN, Norway, March 24, 2014 (ENS) – Today, on the 25th anniversary of the Exxon Valdez oil spill in Alaska, Greenpeace climbers mounted a protest in Norway against an ExxonMobil rig scheduled to drill in the Russian Arctic this summer. On March 24, 1989, the oil tanker Exxon Valdez ran aground in Prince William Sound, Alaska, spilling 11 million gallons of crude oil, the second largest oil spill in U.S. history. The harmful environmental effects are still evident in the spill-affected area. Today, the Greenpeace activists, and many environmentalists around the world, are calling for a ban on offshore oil drilling in the Arctic and for renewed efforts to fight climate change. Erlend Tellnes, Arctic campaigner with Greenpeace Nordic, said, “ExxonMobil plans to drill in the most extreme and remote area of the Arctic this year. This is madness. If something goes wrong, they will be all alone in the far north, with rescue equipment located thousands of kilometers away. We need to stop all oil companies before they cause the inevitable spill in the Arctic, where the harsh conditions would make it impossible to clean up. “Look at Exxon Valdez. It is still affecting Alaskan nature 25 years after the accident, said Tellnes. ExxonMobil is the world’s largest oil company and has a multi-billion dollar joint venture with Russia’s Rosneft to explore for oil in the Kara Sea, a project that will start this summer. It was this exploration that prompted Greenpeace activists to attempt to fly a protest banner from an oil platform last September. Twenty-eight activists and two photo-journalists were arrested by Russian authorities. The “Arctic 30” as they came to be called, were charged with piracy and hooliganism and held in jail for two months before being released on bail. Later charges were dropped under an amnesty agreement. But on March 17, the Arctic 30 applied to the European Court of Human Rights requesting damages from the Russian Federation, as well as a declaration that their arrest and detention were unlawful. Greenpeace still asserts that oil development in the Kara Sea could be disastrous for the Arctic environment. The Arctic is one of the most extreme and hostile environments to drill for oil on the planet, the group said in a statement today. The ExxonMobil drill site is covered by thick sea ice for 270-300 days of the year, while temperatures as low as -45˚C are not uncommon. The Kara Sea is often battered by fierce storms and during the long northern winter is plunged into months of almost total darkness. The drilling block where Exxon will operate overlaps with the legally protected Russian Arctic National Park. The area is inhabited by polar bears and bowhead whales and includes walrus rookeries and one of the largest bird colonies in the northern hemisphere. 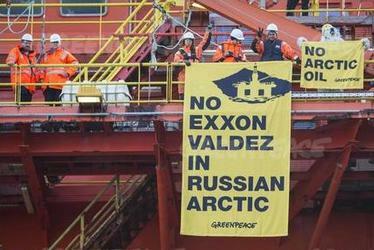 “According to Russian law it is illegal to drill for oil in the area,” Greenpeace said.